I was a non-believer when it came to gaming-grade mousing services. Recently, however, I noticed the SteelSeries Ikari (which has become my mouse of choice) takes a certain degree of pressure before it will move on the surface of my desk. This meant that trying to move the mouse a single pixel (which I have to do from time to time) or with great precision was hampered by a juddering effect that made it frustrating. I had happened across some gaming grade surfaces whilst browsing the SteelSeries website and decided it would be a good idea to give them a try. I requested the SteelSeries 5L and SteelSeries SP. Fast forward a few days and I have enjoyed using the SteelSeries SP as my mousing surface for the SteelSeries Ikari for only a few hours and have already been swayed by its superiority over a generic desk surface. Out of the two, the SteelSeries SP is certainly my surface of choice. Contrary to all I would have previously thought logical it boasts a very rough, very shiny and very magic-eye styled plastic coating over the rubber base through which the SteelSeries logo peeks. The coating is truly bizarre and looking at it too closely will cause your eyes to turn around in their sockets and start boxing your brain. From a distance it looks good enough, but it’s clear that SteelSeries have sacrificed good looks for raw mousing performance. I went cross-eyed, honestly, but didn’t see a boat, horse or test pattern. And why not? The rough coating very effectively minimises the surface area contact with the Ikari laser mouse and the net result is a mouse that glides, dare I say, almost too easily. The important thing is that, at low speeds, the mouse doesn’t catch the SteelSeries SP surface and judder as it did on my desk. For gamers this could mean the difference between a long distance head shot on a target just a few pixels wide or an unfortunate near miss. For general computing it simply makes mousing a more pleasant affair and for working with web graphics using a mouse… I now would not want to part with it. Despite the rubber base, it’s not actually that difficult to slide the SteelSeries SP over my desk, something you don’t want gradually happening when playing games. I haven’t yet encountered any slippage or sliding with normal use, mind, so it could be just grippy enough to last. If you own a less than stellar gaming mouse, or one that has been worn on your desk for too long, the SteelSeries SP comes bundled with stick-on teflon pads which you can use to further enhance your mouse’s slipperyness (is that a word) on the surface. It would not be worth sticking these on over the already excellent but slightly worn pads on my Ikari, but they surely do offer a performance boost to less advantaged mice. The verdict? Well, I have been swayed toward the appeal of gaming-grade mousing surfaces and believe they definitely do make a difference not only for gaming but for general day to day computer usage. 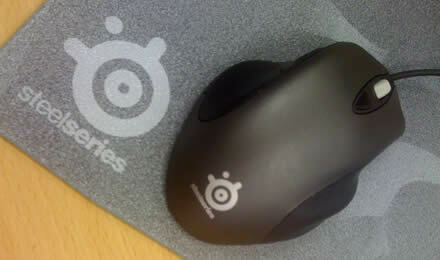 The SteelSeries SP is my favourite out of the SP and 5L, and the 5L will receive its own review shortly. If you’re picking up a SteelSeries Ikari Laser Mouse then there’s no excuse not to plumb a paltry Â£18 for the SteelSeries SP Mouse Mat too! This entry was posted on Thursday, September 18th, 2008 and is filed under Computer Gaming, Personal Computing.